Paris, 26th April, 2017. 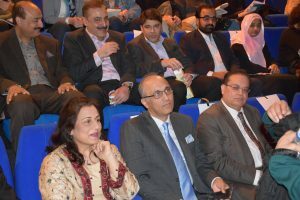 Pakistan Government duly recognizes the importance of societal development and empowerment of people and has embarked on a broad based programme for social sector development. This was stated by the Mr. Haseeb Athar Secretary, Ministry of Education Pakistan in his country statement at the 201st Session of the UNESCO Executive Board held in Paris, France. The session was presided over by the Ambassador Michael Worbs from Germany and was also attended by Madam Irina Bokova Director-General of UNESCO, Ambassador of Pakistan to France and Permanent Delegate of Pakistan to UNESCO Moin ul Haque and other fifty eight Executive Board members. Mr. Athar Haseeb said that Pakistan attaches high importance to education especially the girls education as Pakistan believe that education is an enabler for peace and development, helps in reduction of poverty and inequalities, address extremist tendencies and thus lead to better, peaceful, sustainable and inclusive societies. Secretary Education said that government of Pakistan encourages the women to play their due role in development, prosperity and progress of the country and in this regard a number of legislative, financial and administrative measures have been taken to raise awareness among women about their rights, and participation and protection in public life. 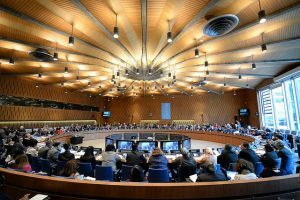 Secretary also reposed Pakistan’s full support to UNECSO and hoped that UNESCO will continue to serve as a house of global peace, constructive debate and meaningful cooperation. 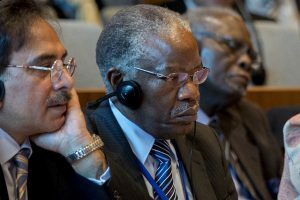 Pakistan believed that UNESCO’s mandate and role of fostering peace and promoting inter-cultural understanding is still important and relevant today. The Secretary assured the UNESCO Board that Pakistan would continue to work together with the global community in striving for an equitable, just, tolerant, open and socially inclusive world to make it a better place for our future generations. 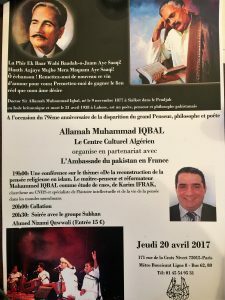 21st April, 2017: Embassy of Pakistan to France organized a conference on the theme, “Reconstruction of Religious Thought in Islam by Dr. Allama Iqbal: A Case Study”, to mark the 79th death anniversary of Dr. Allama Muhammad Iqbal, the national poet of Pakistan in collaboration with Algerian Centre in Paris France, yesterday. The keynote speaker Mr. Karim Ifrak a researcher, historian and specialist on muslim world at the French National Center for Scientific Research (CNRS) read a paper on the theme “Reconstruction of Religious Thought in Islam by Allama Iqbal: A Case Study”. Mr. Karim Ifrak said that Allama Iqbal advised the Muslims to come out of their “intellectual paralysis” and acquired modern knowledge to appreciate and understand eternal principles of Islam which are aimed at regulating collective lives of the Muslims and to provide a foothold to them in the world of perpetual change. 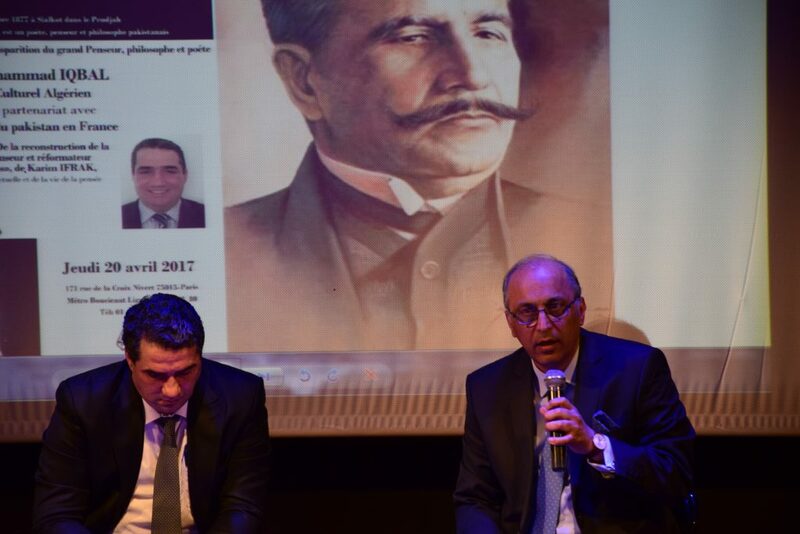 While speaking on the occasion, the Ambassador of Pakistan to France Moin ul Haque said that Dr. Allama Iqbal was one of the greatest poet, thinker and philosopher of the last century. He gave the Muslims of the Sub-continent a vision for a separate homeland and Pakistan today symbolizes the legacy of this great visionary. 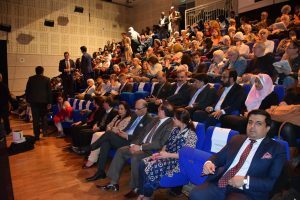 The Ambassador also spoke about Iqbal’s concept of Khudi – the purification of the inner soul to attain higher standards of morality, decency and self-control. 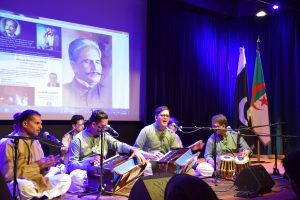 Later, the Pakistan Subhan Group of Qawwals captivated the audience with soulful recitation of poems and couplets from the poetry of Allama Iqbal. 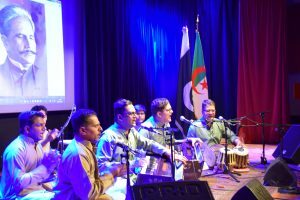 Paris, 4th April, 2017: Pakistani Qawwals Subhan Group gave an enthralling performance during a Qawwali Concert jointly organized by the Embassy of Pakistan to France and Radio France International to mark yearlong celebrations of 70 years of Pakistan’s Independence. 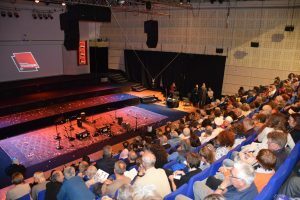 The Qawwali concert held in the spacious auditorium of Radio France International (RFI) in Paris last night attracted large number of sufi music fans from various walks of life. 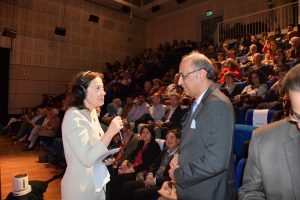 The Ambassador of Pakistan to France Moin ul Haque, who was the chief guest at the occasion, while speaking to Radio France International (RFI) said the Pakistan Embassy was happy to partner with RFI in organizing the concert as part of Embassy’s Public Diplomacy initiative launched in France under the theme ‘Celebrating Pakistan’ to show case Pakistan’s rich music traditions, beautiful landscapes and culture heritage. He said that the Qawwali is an intrinsic part of traditional music of Pakistan and is admired in rest of the world because of its message of divine love and universal brotherhood. 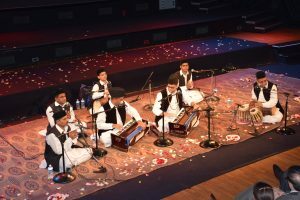 He praised the performance of Subhan Group, which belongs to a respectable Qawwal family of Pakistan. 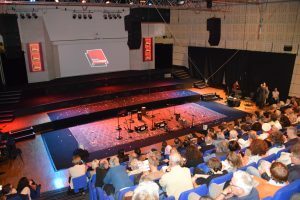 During its month long stay in Europe, the Subhan Group will perform in various cities of the France and Belgium besides giving Qawwali classes to French musicians. 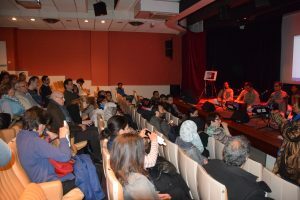 The Qawwali concert by Subhan Group was the second Qawwali event in Paris after successful performance of the Ayaz Farid and Abu Mohammad Qawwal Group in March this year.